Some story points really only have only one place to go; like Ser Alliser outing himself and the council as Jon Snow’s executioners. It was a bit too Julius Caesar for my tastes though. It’s hard to tell if Jon’s supports in front of Ser Alliser would rise up against his defiance. It doesn’t look that way; leaving a sharp focus on the small group of black brothers orbiting now around Dolorous Edd and the Onion Knight. Theon and Sansa being chased by dogs and being rescued was a bit predictable. It’s kind of amazing how they both were unarmed by that same jump off the walls of Winterfell that broke Mryanda’s face at the end of Season Five. I guess Arya was tossed out onto the street by the faceless men to beg for food. to train and change her vengeful ways. * Cersei’s reactions and scenes with Jaime were so real. 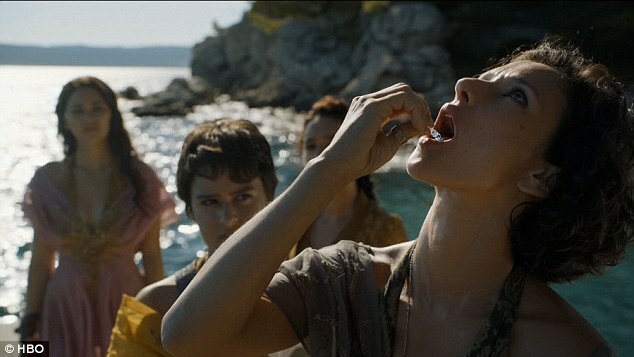 Lena Headey gives enormous amounts of emotional depth to Cersei’s character. She floated me through this episode. * Tyene and Ellaria staging a coup over Doran and his guard was a nice twist. Does that mean Ellaria now rules Dorn? * Daario Naharis went looking for Dany along with Jorah Mormont by themselves leaving a large force of Unsullied and Second Sounds under Tyrion’s watch. How does the whole Naval fleet get burned down without either large groups of troops knowing about it or trying to stop it? Were they old drunk somewhere or killed by the attack on Dany at the colliseum? * How did Obara and Nymeria get on the boat *to murder Tristane* when they were on the dock with Ellaria and Prince Doran *seeing Jaime off with Myrcella and Tristane? * That didn’t make any sense. What would have made *more* sense is if they originally introduced two more other Sand Snakes of Prince Oberyn (since he has eight daughters) *last season* and had those hide on the boat and pop out. They could also digitally airbrush the Sand Snakes out of the dock scenes in Dorne in Season Five. That was just sloppy writing and dragged down my score big time. and it’s clear it’s design is to get Tommen to grow enough balls to have a confrontation with the Sparrow. * Is Melissandre naturally very old and just uses the her Power through the Lord of the Light to *disguise* her age? If she is using the Power of the Lord of Light to prolong her life; why take off her necklace? does she have the power of resurrection like Thoros of Myr? How the heck is Mel going to get them out of that standoff? * Where will Brienne take Sansa to protect her from the Boltons? I am guessing House Umber would be the closest place where Rickon is right? * Does Ellaria Sands now rule Dorn or her eldest Daughter? * Is Ramsay Bolton going to murder Lord Bolton and his wife to secure Winterfell since Sansa is gone? I think Dorn has been a total fiasco since it has been introduced. There has been poor continuity in narrative between seasons and episodes and poor presentation (only principle characters for the most part) and choices devised to shock you rather then tell a reasonably believable story. * Tyrion made a decision to send Myrcella away to Dorn with Ser Arys Oakheart to protect her and betroth her to Prince Tristane. This drove Cersei nuts; she was deeply concerned about Myrcella’s safety. Somewhere between that introduction and Season 5 he mysteriously *disappeared* or was omitted to allow for the plotline for Jamie and Bronn to secretly go down to Dorn to bring her back. This is supposed to be one of the best swordsman in Westeros promoted to protect the Royal family until death. Did he go out for coffee? Was he called back to King’s landing because Cersei suddenly decided to trust the Martell’s with the care of her daughter? Did he vaporize and everyone was given group amnesia by the flashy thing in Men in Black? Possible Fix: They could have very easily had a scene in Dorn where he is killed and had Doran send a message to Jaime at the same time Cersei received the Snake with the necklace in it’s mouth. They could have had Jaime arrive formally and had Bronn sneak into the kingdom and done that story that way. * Myrcella dies meters from the dock with all the Sand Snakes watching from the dock, yet Ser Jaime decides to sail onward to King’s Landing without going back to confront Ellaria. Jaime is smart enough to know Ellaria was behind this. He knows Ellaria doesn’t get along with Doran (scene where they are eating in Season five) and why would Doran kill Myrcella at the risk of harm to Tristane? Why isn’t Jaime turning the boat immediately around to confront Ellaria? Possible Fix: Jaime turns the boat around to confront Ellaria in front of Doran. Doran doesn’t have a lot of guards around and since it’s only Jaime and Bronn versus the Sand Snakes they have to retreat back to the boat. Doran and Tristane and the guard all get killed and Jaime sails back to King’s Landing with Myrcella’s body. * Doran only has one Kings guard person who is very easily stabbed in the back and dies? Possible Fix: Fork out the dough for more Sand Snakes and King’s Guards. Even better use the possible fix I mentioned above and lose these scenes altogether. * Tristan is killed by two Sand Snakes on Jaime’s boat in King’s Landing while he is ashore with Myrcella’s body and Cersei. This is bizarre because these very same Sand Snakes are all on the dock saying goodbye to the boat that was sailing away with Myrcella, Tristan, Ser Jaime and Bronn at the end of Season Five. Did they get a soundless, invisible speedboat that allowed them to board the boat near Dorne and then they hid and surprised Tristane without anyone else on the boat detecting them? Doesn’t make sense unless they set sail in their own vessel once Jaime was out of visual range and Doran went back to the Palace; caught up to the boat in King’s Landing in the harbor and watched while Jaime left it with Myrcella’s body in the rowboat and then boarded the sailboat when no one was watching to kill Tristane. Possible Fix: Digital erase the two sand snakes that appear on the dock with Ellaria at the end of Season Five saying goodbye to Myrcella, then what we saw makes sense in Season 6 Episode 1 with the assassination of Tristane. 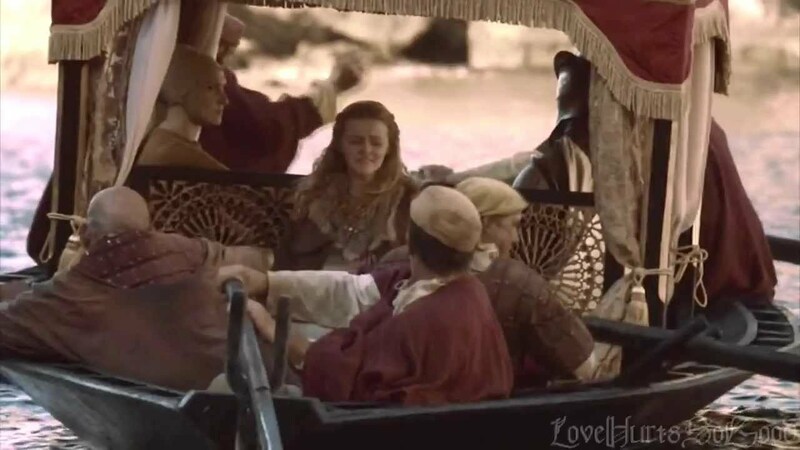 Another way is to add two Sand Snakes all the way back in Season 5 and then don’t show those two on the dock and have those two assassinate Tristane.